Well, the time is almost here for Viva Las Vegas 18- Jennifer and I shall be leaving on Thursday and driving up to the infamous desert resort, for some superb Music, great food, hanging by the pool, trying cocktails and generally enjoying the whole sin City deal. There sure is a lot that’s happening at the Orleans Hotel and if you can make a trip to Nevada this week and weekend, then this really be something that you will remember. Check out: http://www.vivalasvegas.net/ as that will have ALL the schedules of events and a great event this is to be seen. I have been going to Toms gigs for over 3 decades and this brings people from all over the globe, its a must see event if you have never been before and a great way to catch up with old and new friends too. Tons of bands to choose from too, so hope to see some of you there. There will be new Rockabilly Bands and some famous old school ones for sure, the Sonics will be playing and i for one think that will be great to see. Also Joe Clay will be playing, I first saw him in the early 1980’s when he was rediscovered and been many years since I have seen the old fella play and a great opportunity to see the Blonde Bomber crank out his old hits. here is just some of the bands and Dee Jay’s that will be attending this week. 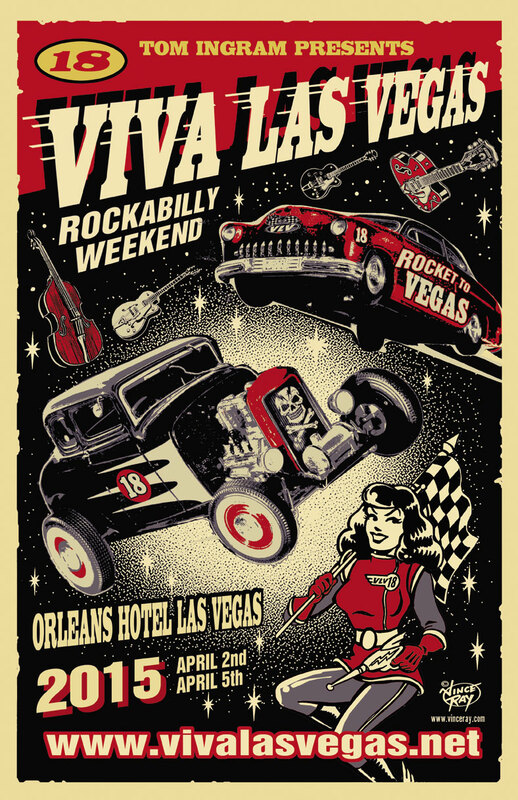 18th Annual Viva Las Vegas Rockabilly Weekender. Click on each artist’s name for a link to their website or Facebook page. 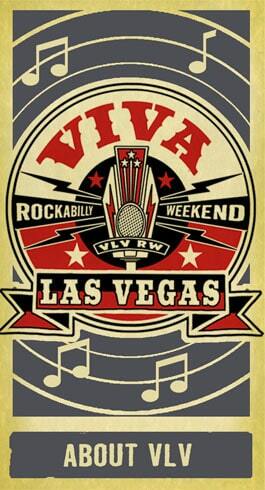 VLV Countdown – You Ain’t Doin’ Viva Right if…..
VLV Countdown 70 Days To Go! VLV Countdown – Tips for Saving Up! How To Be A Rockabilly Socialiate VLV Style! VLV Fashion Week Clothing Bloopers! VLV Countdown – Time To Start Working Out!Thank you Dollie Deville for your helpful tips. If you would like to submit information for this page, please email manisha@vivalasvegas.net. The Tiki Pool Party has become one of the major events at VLV, and will take place on Friday, Saturday, and Sunday. It is a great opportunity for girls (and guys!) to show off their vintage swimwear. New to VLV18 – The Pool Party will begin early, at 9am, on Sunday! As you know, there are a limited number of cabanas at the pool for VLV and the hotel is getting a lot of requests so here is the plan. A cabana for Friday, Saturday or Sunday will be $250 for a day. That includes guaranteed entry to the pool area for 10 people. Between now and March 8th please send an email to cabana@vivalasvegas.net On that day we will randomly draw winners who will then be able to phone the hotel and deal with the payment. Don’t forget that the pool party will be for 3 days this time and you will automatically be entered into the drawing for all 3 days. The hotel also hopes to have even more cabanas installed by then. Are you a vintage swimwear enthusiast! Well, come out for 3 days of fun in the sun while wearing your best poolside attire. We have 3 fun, fashionable contests spread over 3 days! We’re looking for contestants with the best AUTHENTIC VINTAGE (pre-1970) swimwear. If you would like to compete in one of the contests, please follow the guidelines below, registration for Friday & Saturday differ from the registration process for Sunday, so please read carefully. The Men’s Swimsuit Contest on Friday & the Couples Swimsuit Contest on Saturday, both do NOT require pre-registration. Arrive no later than 3PM at the Lucy B cabana at the Pool Party to sign in and receive your number, it’s as easy as that! Tom Ingram and Audrey Deluxe are back with the World Famous Viva Las Vegas Burlesque Showcase! The gates will be locked at 10pm each night. No unauthorized persons may stay in the Car Show area after 10pm including on Saturday. Security will be posted in the area when the gates are locked and throughout the night. For safety reasons, cars cannot leave the area or be moved between the hours of 9am and 8pm, They can only be moved or leave the area at 8pm or 30 minutes after the last band finishes playing, whichever comes later. The gates will be locked at 10pm and no cars can leave after that time. The gates will re-open on Sunday morning at 8am. This entry was posted in Blog and tagged 45 rpm, clothing, cocktails, cuffed jeans, double bass, fender guitar, gab shirts, hot rods, jiving, motorcycles, pin up, pool party, rock n roll, rockabilly, rockin, ton up, Viva las Vegas. A Day out with The Ton Up Boys!